(Los Angeles, CA) January 25, 2018 – Latino Public Broadcasting (LPB), the WORLD Channel and KQED today announced the launch of Storybored USA, a new web series designed to empower diverse youth and millennials to tell their stories through creative arts and media. The ten-part series launches today at www.youtube.com/worldchannel with the first two episodes; two additional episodes will launch every Thursday from February 1-22. 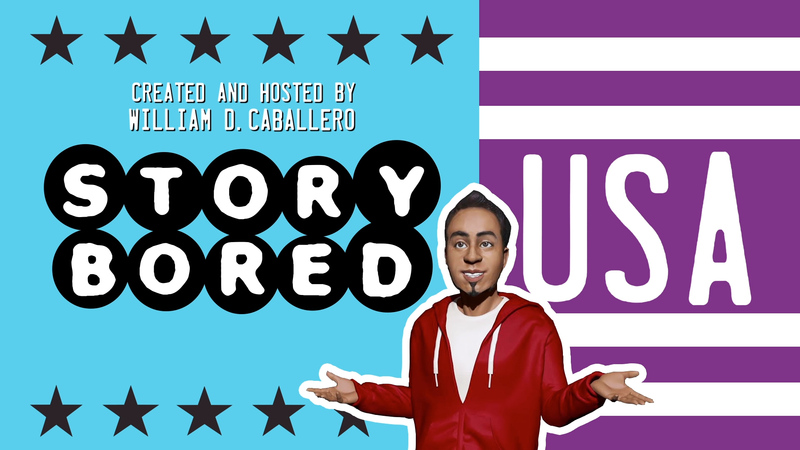 Storybored USA is a co-production of William D. Caballero and Latino Public Broadcasting, and is a presentation of WORLD Channel, in association with KQED. Major funding provided by the Corporation for Public Broadcasting. Hosted by a 3D printed figure of show creator/writer, William D. Caballero, and set in a scaled-down replica of his studio, each episode explores various aspects of the creative process through interviews with emerging and established artists who serve as creative coaches, offering personal and practical advice. Caballero also looks at the lives and work of legendary artists, from Frida Kahlo to Beethoven to Lin-Manuel Miranda, showing how they were able to persevere and reframe the narrative. Each of the ten episodes are designed to encourage all diverse people to add their creative voices to the American story – serving as a reminder that if they don’t tell their stories, someone else will. William D. Caballero is an NYC/NJ-based filmmaker, composer, and multimedia storyteller. Born in Coney Island, New York and raised in North Carolina, Caballero earned the prestigious Bill Gates Millennium Scholarship, and returned to New York City where he graduated from Pratt Institute (BFA Digital Art, 2006) and New York University (MA The Arts and Humanities in Education, 2008). One of Caballero’s first professional projects was American Dreams Deferred, a feature length autobiographical documentary about the health, financial, and social difficulties facing his Puerto Rican-American family. The film was selected for the NALIP (National Association of Latino Independent Producers) Latino Producers Academy, eventually receiving the first annual HBO-NALIP Documentary grant. Five years after its conception, it premiered on PBS on December 2012. In 2010, the Apollo Theater commissioned Caballero to perform Speak! So The World Will Listen! Uganda, a multimedia advocacy concert. Shot on location, the project featured the audio testimony of Ugandan war orphans and gay rights advocates, blending music, visuals, and documentary, and premiered at the Apollo. In 2012, he completed Seed Story, a macro short film featuring a cast of hundreds of one-inch tall plastic hand-painted figures, which debuted the following year at the Slamdance Film Festival and later became a Vimeo Staff Pick. In 2013, Caballero was selected for the prestigious Aljira Emerge program (in partnership with Creative Capital), a strategic career management and exhibition platform for emerging artists. Later that year, he was invited to the Bill Gates Leadership Conferences in Washington, DC and San Jose, CA as an ‘alumni guest-of-honor,’ where he gave a keynote speech based on his experiences and successes in front of 1000 college students of color and fellow recipients of the Gates Scholarship. Caballero’s recent achievements include Gran’pa Knows Best, an interstitial series based on his short film, How You Doin’, Boy?, which was licensed by HBO LATINO in 2015. Two seasons of the show are currently available on HBO GO, HBO NOW, and HBO ON DEMAND. In September 2016, Univision debuted his web series Dreamer Generation, which features the stories of members of the Dreamers’ Movement, shot using 3D scanned/printed miniatures. The Smallest Step premiered on public TV’s World Channel and his latest short film, Victor And Isolina, debuted at the 2017 Sundance Film Festival. You can see more at www.wilcab.com. In this debut episode, host William D. Caballero examines Spanish colonization and the various peoples and cultures that came fused together to create the Latin-American identity. It also examines the dangerous impact of a society that excludes people from contributing culturally, due to the color of their skin, how they worship, and who they love. This episode’s creative coach is spoken word artist, Yosimar Reyes, who, as an undocumented, queer artist, struggled to find role models. This episode explores the notion of a “single story,” a phrase coined by Nigerian author Chimamanda Ngozi Adichie. This can be summed up as an unbalanced social narrative caused when the majority culture dominates and shapes the stories of minority cultures. In order to counter this influence, it is the responsibility of artists of color to create powerful art in their own unique voice. Featuring Yosimar Reyes. While pain is an unfortunate side effect of the human experience, it can be a powerful vehicle for creative expression. Mexican artist Frida Kahlo taught herself how to paint and used her art to communicate the pain she felt on a daily basis. Her art also expressed the pride she felt in her culture, her sexuality, and her womanhood. This episode’s creative coach is video game developer Zhenghua Yang, who dedicates his life to creating games to help people, after overcoming a life- threatening illness. Episode 4: EVERYONE’S A CRITIC! negative feedback to help shape your artistic voice. Some critics only care about the work (objective critics) while some care more about the artist (subjective critics). Either way, the greatest artists of all time trusted their voices and not the opinion of critics, and in time, so will you. This episode’s creative coach is fashion designer Samantha Black, former contestant on Project Runway and Project Runway All-Stars. When an artist is faced with illness, disability, or even self-doubt, it can serve as a wake-up call, reminding us that we only have so many days on earth to produce our own art, in our own voice. Artistic expression is a great way to channel this energy into a body of work that encapsulates who you are, and the powerful social causes you believe in. This episode’s creative coach is Heather Mae, a folk singer dedicated to creating songs about social change. Whether you’re a black man inhabiting your inner-Asian man, or an Arab man connecting with your inner-white woman, in order to write about another person’s experience, we must be able to channel the inner-connectivity found within us all. The best way to accomplish this is to create more and more art, with each subsequent work pushing the boundaries of what your unique creative voice can express. This episode’s creative coach is British actor, director, writer, producer, musician, and creative mentor, Rikki Beadle-Blair. In order to become accomplished artists, we must think of ourselves as professionals. In his influential book, “The War of Art,” author Steven Pressfield identifies the enemy that stands in the way of every artist who doubts him/herself: resistance. By overcoming resistance, we gain a new sense of self-discipline that can help us as we embark on our creative journey. Featuring infographic art by illustrator Sunni Brown. This country, and its creative spirit, is shaped by the countless waves of immigrants who have landed upon its shores. By examining the Broadway musical “Hamilton,” artists of colors are encouraged to add their voices to the American narrative while gaining a new level of respect for the countless individuals who come to this country in search of freedom and opportunity. This episode’s creative coach is Gonzalo Alvarez, a talented illustrator and video game designer. This video features each of the past weeks’ creative coaches offering their own practical advice on what an emerging artist can do to stay creative, innovative, and productive.